The CAI houses a Zooarchaeology Laboratory that supports the study of human-animal relationships and ancient animal populations. 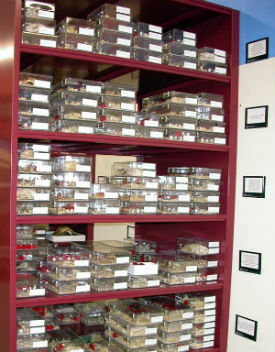 The Zooarchaeology Research Laboratory, established in 2004, houses one of the largest comparative collections of modern animal skeletons in the greater Midwest. The collection contains more than 900 skeletons representing over 200 animal species (including mammals, birds, reptiles, fishes, and mollusks). Comparative skeletons are vital tools in zooarchaeological research, because they allow faunal analysts to match ancient bone fragments recovered during archaeological excavations to whole bones from modern animals of known species. The research conducted in this lab includes projects by undergraduate and graduate students and faculty.